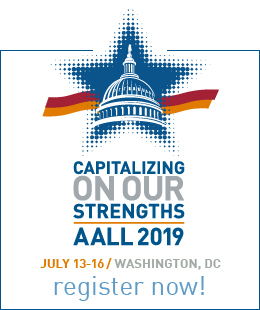 OBS-SIS is committed to the continuing education of its members and sponsors several programs at each AALL annual meeting. The Education Committee works with OBS-SIS members on program proposals for the annual conference. Recent topics cover a wide variety of subjects, from migrating to a new automated system to management of both people and websites. Committee meetings provide essential networking and more informal means of continuing education and are an essential part of OBS-SIS members’ schedule at the annual meeting. Here is a schedule of OBS activities for the 2017 AALL Annual Meeting. In addition to these activities, please look for us by the OBS-SIS poster in the exhibit hall during breaks. Saturday, July 16, 1:30-5:00 p.m.
Saturday, July 16, 1:45-2:45 p.m.
Saturday, July 16, 7:00-9:00 p.m.
Sunday, July 17, 7:30-8:45 a.m.
Sunday, July 17, 2:30-3:30 p.m.
Sunday, July 17, 4:00-5:00 p.m.
Monday, July 18, 7:30-8:30 a.m.
Monday, July 18, 9:45-10:45 a.m.
Monday, July 18, 5:00-6:00 p.m.
Monday, July 18, 6:00-7:00 p.m.
Tuesday, July 19, 7:00-8:15 a.m.
Saturday, July 18, 7:00-9:00 p.m.
Sunday, July 19, 11:30 a.m.-12:45 p.m.
Sunday, July 19, 1:00-2:00 p.m.
Sunday, July 19, 5:15-6:30 p.m.
Monday, July 20, 10:00-11:00 a.m.
Monday, July 20, 3:15-4:30 p.m.
Monday, July 20, 4:45-5:30 p.m.
Monday, July 20, 5:30-6:30 p.m. Program I1: BIBFRAME Deep Dive: How Did We Get Here and Where Are We Going? Tuesday, July 21, 2:00-5:00 p.m.
-do not miss this great opportunity to send some of your young co-workers to this event. Saturday, July 12, 8:00 a.m.-3:00 p.m.
Saturday, July 12, 1:45-2:45 p.m.
Saturday, July 12, 3:00-4:00 p.m.
Sunday, July 13, 11:45 a.m.-1:00 p.m.
Our VIP, for the 2014 Annual Meeting is Nicole Engard, who will speak during OBS-SIS Local Systems Roundtables. This will not follow a roundtable format, but instead will be a program that will definitely be worth attending. This program will be held in Marriott Riverwalk’s-Travis Room. 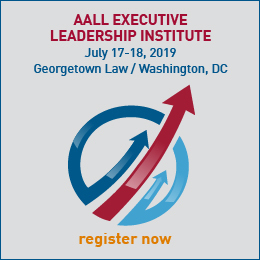 Please note that because this program will happen during a roundtable, it will not be listed on the AALL program schedule.Nicole C. Engard is the Vice President of Education at ByWater Solutions. Her primary role at ByWater Solutions is to educate librarians about open source software with a focus on the Koha ILS. In addition to her daily responsibilities, Nicole keeps the library community up to date on web technologies via her website “What I Learned Today…” (www.web2learning.net) and volunteers as a community moderator on opensource.com. In 2007, Nicole was named one of Library Journal’s Movers & Shakers and in 2009 she was the editor of “Library Mashups,” a book published by Information Today, Inc. and in 2010 she authored “Practical Open Source Software for Libraries,” a book published by Chandos Inc. and in 2012 the second edition of “The Accidental Systems Librarian” which she worked on with Rachel Singer Gordon was released. The topic of Nicole’s presentation is Open Source Software: a Community and a Philosophy of Freedom. Monday, July 14, 11:45 a.m.-1:00 p.m.
Monday, July 14, 5:30-6:30 p.m.
Tuesday, July 15, 7:00-8:15 a.m.
Tuesday, July 15, 10:15-11:30 a.m.
With ILS costs skyrocketing and library budgets shrinking, libraries are increasingly turning to new models of affording the ILS they want. Open Source ILSs are one answer. Consortia are another. The Orbis Cascade Alliance is implementing a new library management service to be shared by all 37 members of the consortium. Soon all these libraries in the Pacific Northwest will be sharing not only a catalog, but also cooperative collection development, digital initiatives, and discovery services. Hopefully, this will result in better services for students, faculty, and staff. Is it worth giving up the autonomy of a separate institutional ILS? What are the costs, and what are the benefits? This program is sponsored by the OBS-SIS. Takeaway 1: Participants will be able to assess the benefits and drawbacks of a consortial library management service from the big picture – i.e., what’s in it for a director? Takeaway 2: Participants will be able to assess the benefits and drawbacks of a consortial library management service from the nuts and bolts – i.e., what’s in it for technical services? Takeaway 3: Participants will be able to assess the benefits and drawbacks of a consortial library management service for user experience – i.e., what’s in it for the people on the front lines? Who Should Attend: Library directors, public services librarians, technical services librarians – from any type of library. This is the final schedule for the OBS-SIS business meetings and educational programs planned for the 2013 AALL annual meeting. Presentation slides and handouts for the programs will be posted here as they become available. Saturday, July 13, 1:45-2:45 p.m.
Saturday, July 13, 5:30-6:30 p.m.
Saturday, July 13, 7:00-9:00 p.m.
Sunday, July 14, 7:00-8:15 a.m.
Sunday, July 14, 12:30-1:45 p.m.
Room: WSCC-Room 204This roundtable is open to anyone who uses OCLC products or services, and will feature the OBS-SIS OCLC liaison, Glenn Patton, Director of the WorldCat Quality Management Division at OCLC, as the speaker. Glenn will discuss OCLC’s new and enhanced services, as well as planned future developments. Following this overview, the bulk of the roundtable time will be allotted to audience members to ask questions and to share comments, ideas, and concerns with the speaker and other OCLC users in the audience. Come prepared both to learn and to participate during this informative and interactive session. Sunday, July 14, 2:00-3:30 p.m.
Room: 615-617The Library of Congress’ Bibliographic Framework Transition Initiative will transform existing metadata (the MARC format) into a sustainable bibliographic encoding system, connecting library resources to the whole world of information resources. Does the library’s initiative enable current library metadata to be used in linked data technology to construct a core data model for library applications? Can a huge library infrastructure built up over the years around the MARC format be harvested by the new and emerging content standards to support prototype services? How can future bibliographic control standards leverage all the services to benefit the community? You will find answers to these questions in this program. Panelists: Karen Coyle, Eric Miller, Glenn E. Patton. Takeaway 1: Participants will be able to explain three significant reasons for the new bibliographic framework. Takeaway 2: Participants will be able to describe a new code system to replace Machine Readable Catalog (MARC). Takeaway 3: Participants will be able to design an action plan to make library resources accessible in Semantic Web. Who Should Attend: Technical services librarians; library administrators who are interested in the future bibliographic control. Sunday, July 14, 5:30-6:15 p.m.
Monday, July 15, 11:45a.m.-12:45 p.m.
Sunday, July 15, 5:30-6:45 p.m.
Room: WSCC-Room 210At the106th AALL Annual Meeting on Monday July 15th at 5:30 p.m., the Local Systems Roundtable will present the trailblazing work of the Orbis Cascade Alliance– a 37-member academic library consortium that includes 6 law libraries in Oregon, Washington, and Idaho. Beginning in 2013, the members of this consortium began migrating from individual integrated library systems to a shared library management system— the Ex Libris Alma and Primo management system. This roundtable will focus on the planning and implementing of a shared system by the first cohort of libraries that led to making their vision a reality. Three members from the Alliance will lead an informal moderated roundtable, which will include both prepared and real-time questions from the audience. Orbis Cascade Alliance Presenters: Bill Kelm, Systems Librarian at Willamette University in Salem, Oregon; Al Cornish, departing Systems Library at Washington State University at Pullman and incoming Shared ILS Program Manager for the Alliance staff; and Ann Nez, one of our own and Coordinator of Technical Services at Gallagher Law Library at the University of Washington. Tuesday, July 16, 7:00-8:15 a.m.
Room: WSCC-Room 213Each attendee will be given a passport and will visit four countries (or experts) — including Anne Klinefelter, who will talk about the writing workshop she hosts each spring, Marguerite Most, who will talk about how to get involved with editing, Michael Maben, who will talk about how to write for TSLL, and one other. Each attendee who receives passport stamps from the four experts will have their name entered in a drawing for an Amazon gift card. Monday, July 16, 8:30-9:45 a.m.
Room: 618-620While cloud computing is revolutionary in the legal context, it does have a potential impact on legal risk. Once the data is on the web, where does it reside? Electronically stored information on the cloud is subject to different protections than information stored in-house. Warranties are given by the customer instead of by the service provider for privacy and data security. If your library chooses a cloud solution, which regulations do you need to be familiar with to protect client/patron data? Identify key factors to discuss and negotiate with service providers before giving assent to their Service Level Agreements (SLAs). Takeaway 1: Participants will be able to identify at least three important laws and regulations to consider for cloud-based solutions. Takeaway 2: Participants will be able to create legal strategies to successfully migrate their library data and services to the cloud. Takeaway 3: Participants will be able to predict three potential risks for cloud implementation. Who Should Attend: Administrators interested in cloud computing implementation; information technology and technical services/systems librarians. Monday, July 16, 3:45-4:45 p.m.
Room: 606-607Joseph Janes, writer of American Library’s “Another Story” column, curator of the podcast series “Documents that Changed the World,” and associate professor and MLIS program chair at the University of Washington iSchool, will discuss what’s in store for the library of the future. Takeaway 1: Participants will be able to identify coming trends in library technology. Takeaway 2: Participants will compare a broad picture of evolving library technology with the constant of human searching behavior. Takeaway 3: Participants will assess whether information technology in their libraries is in line with current trends. Who Should Attend:All librarians—technical service librarians, reference librarians, library management, private law librarians. Track(s): Library Management, Information Technology, Reference, Research and Client Services, Collection Development and Cataloging, General or Core Programs.